Anchorage RV Rentals let you enjoy the great Alaskan wilderness; and get you to places far out of the way without compromising the comforts of home. As the largest city of the Last Frontier, Anchorage is the transport hub of the region; which is serviced by major international carriers flying in and out of Ted Stevens Anchorage International Airport, Alaska, USA. You can book your RV rental vacation in Anchorage ahead of your arrival (especially if you are coming in summer), and pick up the keys to your motorhome rental from operators maintaining offices less than 10 miles of the airport. You can compare and book online with Alaska Motorhome rental companies like Cruise America RV Rentals and Camper1 Alaska who have flexible return policies and comprehensive road assistance; to get the best price on Anchorage RV rentals. Alaska is notorious for its unforgiving winters; so you may want to consider coming in between the months of May through September, when temperatures are moderate, with the month of June the most pleasant as days are sunnier and daylight hours way longer (an average of 19.5 hours). There is a plethora of summer activities; that you can engage in as you explore the Alaskan wilderness with Anchorage RV rentals. The downtown area, about 15 minutes north of the airport, is a great first stop; since it is the historic core of Anchorage and the hub of all tourist activities. Cook Inlet is the arm of water that extends from the Gulf of Alaska to Anchorage; so you are in for whale-watching treat as the Beluga whale population is revitalized in designated protected areas around the urban center. On the west coast of Anchorage lies Earthquake Park. This is where you can see what a major shaker can do, as what happened in this area in 1964. Ship Creek to the north offers rich fishing grounds and viewpoints for shorebird watching, and you can hit the Tony Knowles Coastal Trail on a bike from here until 11 miles down. Motorized and recreational vehicles are not allowed on the trail, but there are plenty of RV camps to the east where you can hook up for electricity, water and sewage while you hit the trails. Two miles further south on your Anchorage motorhome rental holiday is the foothills of Chugach Mountains, where moose and bear sightings are plentiful. Potter’s Marsh is in the vicinity, a wilderness area where you can catch eagles overhead, water fowl and migratory birds. The eastern arm of Cook Inlet that borders Anchorage to the south is ideal for kayaking and boating; but do watch out for tidal bores (when incoming tide washes up a narrow channel against the direction of the current). 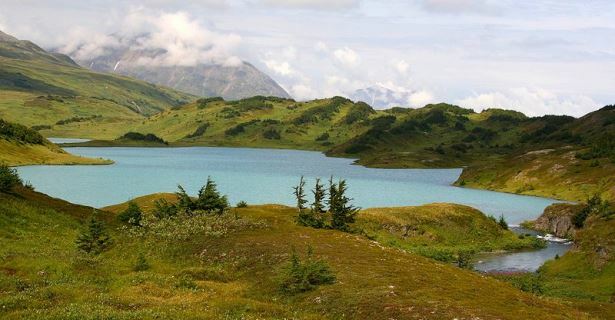 If you feel more adventurous, you can drive your RV rentals from Anchorage to Valdez; a trip which takes just over 5 hours, and gives you access to Prince William Sound. You can meet up with the native villages found offshore, or join a cruise for more wildlife sightings. For those wanting to drop off at a different location there are one way motorhome rentals available in the USA.